IAB Australia has released its latest audio advertising report. The top takeaways point to continuing growth in the digital audio ad space, an interest in exploring new formats in streaming audio and podcasts. Two-thirds of media agencies regularly buy streaming audio ads. Three-quarters of media agencies plan their broadcast and streaming audio efforts in tandem, up from two-thirds last year. More than half the media agencies will make programmatic audio ad buys in 2018. The IAB also placed a focus on podcast advertising, which is seeing more interest from media agencies. In 2017, it was dubbed a “significant part of activity” for just 1%, while 34% have experimented. Thirty-eight percent said they had no experience in the space, but did have plans. 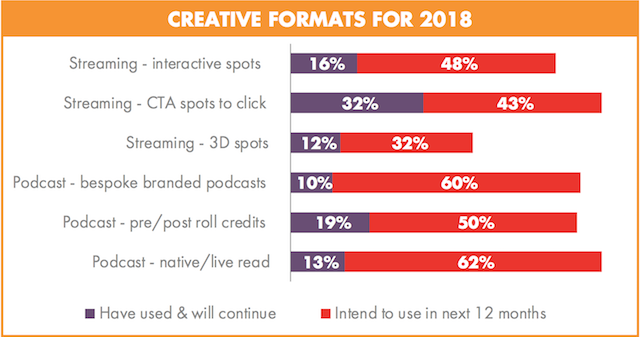 The portion who claimed “no experience & no plans” in podcast advertising dropped from 33% in 2016 to 15% in 2017.